One of the most commercially successful blues artists of the 1930s, along with the likes of Big Bill, Josh White, and Peetie Wheatstraw, was Blind Boy Fuller, who cut 130 sides—both low down blues and peppy rags—between 1935 and 1940. The artist who would become Blind Boy Fuller was born Fulton Allen on July 10, 1907 (or 1904, according to some sources) in Wadesboro, North Carolina, one of ten children born to May Jane Walker and Calvin Allen. He learned field hollers and old time songs from his elders, and took up the guitar. As a result of untreated neonatal conjunctivitis, Allen began to lose his sight in his teenage years, and was totally blind by the end of the 1920s. Unable to continue working manual labor, he turned to performance, playing street corners, rent parties, and the like, eventually settling in Durham, North Carolina. There, he developed a following amongst the local musicians, including Bull City Red, Sonny Terry, and Dipper Boy Council, with whom he would later record. In 1935, J.B. Long, manager of the United Dollar Store discovered Allen, and arranged for him to record for the American Record Corporation in New York City as “Blind Boy Fuller”, along with Bull City Red and Rev. Blind Gary Davis. Fuller made his debut in four sessions from July 23 to 26, 1935. He would return to New York seven times, and also travel to Columbia, South Carolina, Memphis, Tennessee, and Chicago, adding up to a total of twenty-three sessions (if my count is correct) between 1935 and 1940 for the ARC, plus two in 1937 for Decca. He was scheduled to appear in John Hammond’s From Spirituals to Swing concert at Carnegie Hall in 1938, but was unable to make it, as he was in jail for shooting at his wife (no small feat for a blind man). Sonny Terry substituted for him. Fuller’s health was in decline by the early 1940s, owing to a heavy alcohol intake causing him kidney troubles, and he had his last record date on June 19, 1940, in Chicago. Following a period of infirmity, Fuller died of pyemia on February 13, 1941. 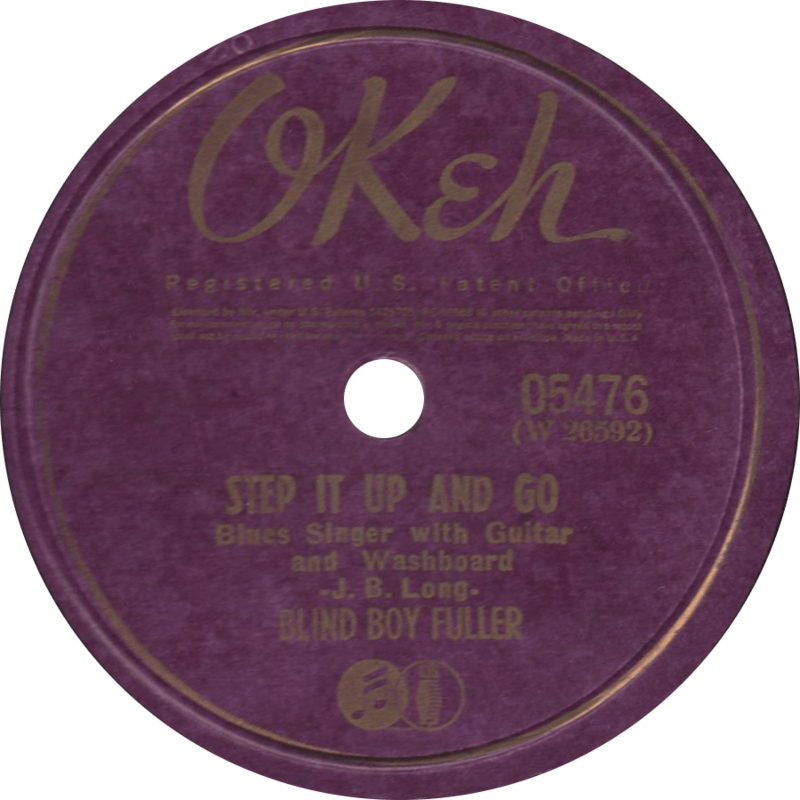 Okeh 05476 was recorded on March 5 and 6, 1940 in New York City by Blind Boy Fuller. On the former, Fuller is accompanied on washboard by Bull City Red (real name George Washington, also known as “Oh Red”). It was originally issued on Vocalion with the same catalog number, and later appeared on Columbia 37230 and 30011 around 1946. On the first side, Fuller does one of his best remembered rag tunes, the classic boogie number “Step it Up and Go”, with some lively picking on his National Duolian. Step it Up and Go, recorded on March 5, 1940 by Blind Boy Fuller. On the flip, he plays a little bluer on “Little Woman You’re So Sweet”, with a tune in the “Sitting On Top of the World” family. If you ask me, these lyrics are nothing to write home about, but the delivery is top-notch! 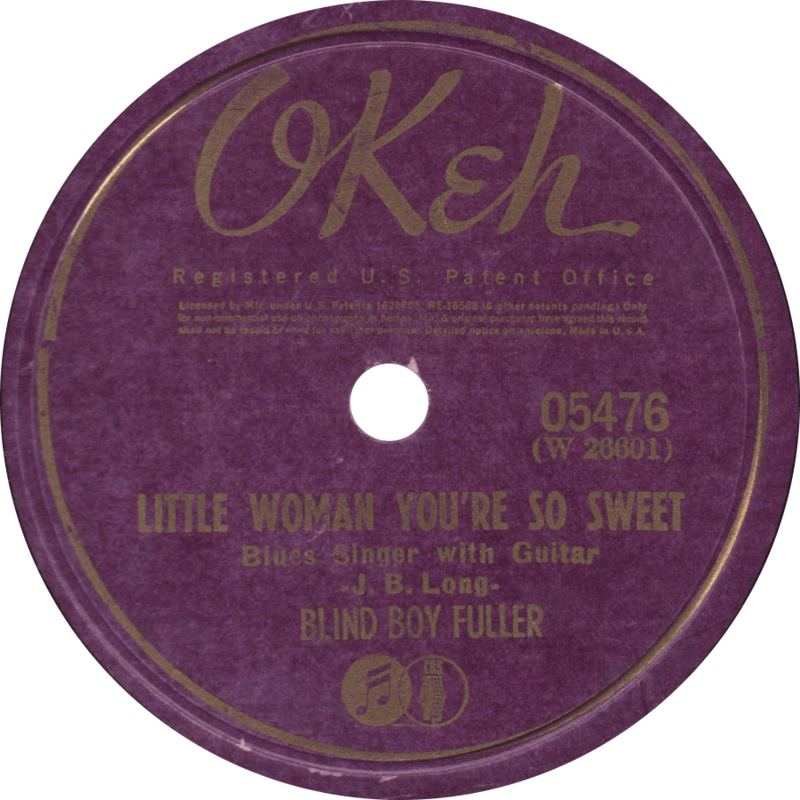 Little Woman You’re So Sweet, recorded on March 6, 1940 by Blind Boy Fuller. This entry was posted in Records and tagged 1940, 1940s, Blind Boy Fuller, Blues, Bull City Red, New York, Okeh, Piedmont, Singing with Guitar by R. Connor Montgomery. Bookmark the permalink. Step it up and Go with that great washboard percussion, loved it !